One of our most colorful vegetables, Rainbow Chard is such a treat to see and enjoy! This vibrant vegetable is a great addition to any meal that needs a little extra green. Make it the star of your dish by incorporating it into a salad or sautéing it for the base of your meal, or sneak it into sandwiches, soup, or even pizza for a more subtle addition. 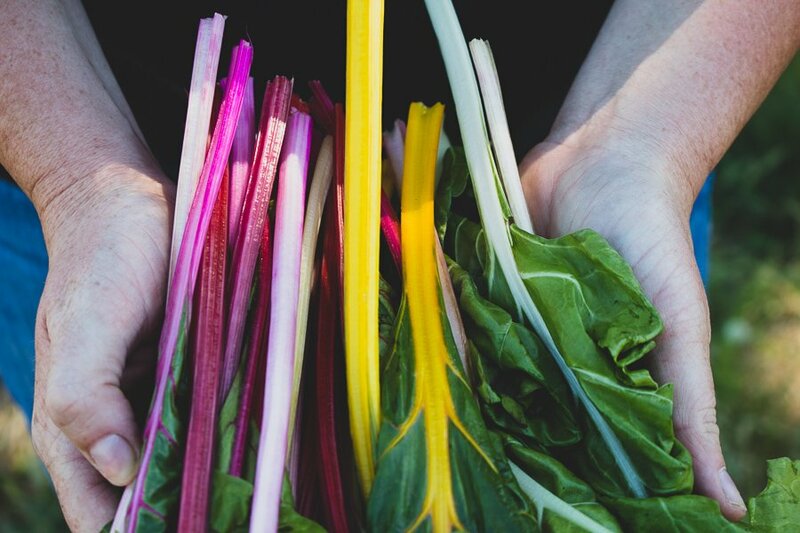 Any way you enjoy it, Rainbow Chard is a beautiful, colorful leafy green that is just begging to be added to your plate! Read on for our favorite ways to prepare our Rainbow Chard. In a medium saucepan, heat the oil over medium heat. Add onion and sauté until just translucent. Add red pepper flakes, garlic, and chard. Sauté over medium heat until leaves are desired softness, about 5 minutes. Combine all ingredients into a food processor and pulse until smooth. Heat oil in a medium skillet over medium heat. Toss pine nuts and herbs into oil until just browning. Add sundried tomatoes, and beans, if using, until warm and softened. Toss Rainbow Chard, Spinach, and Parsley and sauté until wilted, about 6 minutes or until desired softness is reached. Season with salt and pepper. Take mixture off the heat and let cool in a bowl about 5 minutes. Top with pickled onions, goat or feta cheese, and fresh parsley for garnish.